It is a leading cause of death for children in the United States. Every year hundreds of children are involved in fatal vehicle crashes and authorities say nearly half were not properly restrained. The rise in ridesharing apps like Uber and Lyft has become a popular, even preferred method of transportation for millions of people including families with children. Contact 13 conducted an undercover investigation to find out just how safe children are in rideshares and to see if drivers would be willing to transport underage children without a proper seat or restraints. We recruited Sarah Robbins and her two-year-old daughter Caroline to test the scenario. Contact 13 requested three rides from Uber and three rides from Lyft, none of which arrived with a child seat. During the two day test period, five of the six drivers volunteered to carry Sarah and her daughter without a child restraint. Reporter: "We have a two-year-old -- do you have a car seat or --?" Driver: "I have a seat belt for the middle, ok? She can sit in the middle, she'll be fine." 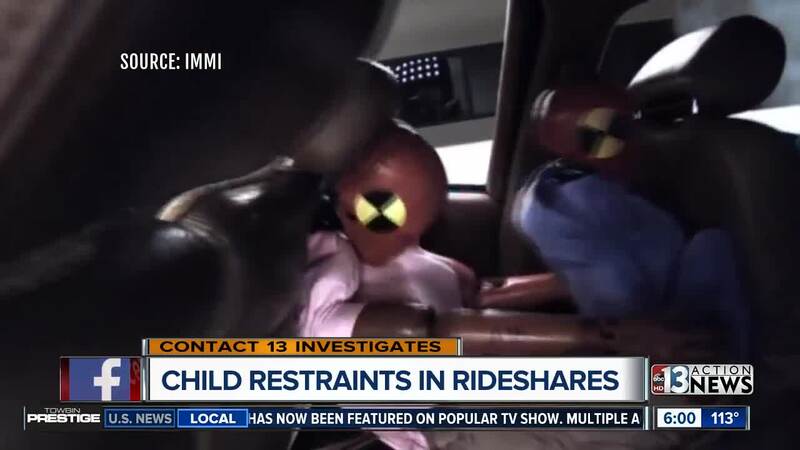 Contact 13 reached out to the Nevada Transportation Authority and a spokesperson said rideshares are defined as 'taxicabs' and under Nevada law they are specifically exempt from child restraint requirements. "I mean it's scary," said Sarah Robbins. "Car seat safety is really in the news and in public policy right now, and I feel as adults concerned about the next generation, we should all be aware of what the laws are and what the best practices are for kids," added Robbins. Contact 13 showed the undercover video to Heather Watson, President of Safe Kids Clark County , an organization focused on child safety and car seat restraints. "This is a liability right here," said Watson. "I mean, they have unprotected children in their cars and they are projectiles if they're being held by their parents," added Watson. "If they take one ride, without a car seat or booster seat, who is to say that one ride isn't the ride that they are involved in a crash," said Watson. Contact 13 looked up Uber and Lyft Policy regarding children and restraints. Uber tells Contact 13 they direct drivers to follow all state and local laws. Lyft also has a similar policy , and suggests parents who are traveling with children should provide their own restraint.